In order to make changes in life we need to first be able to acknowledge and accept the things that we want to change. Digging deep into why we are the way we are in the present moment will bring up many uncomfortable things from the past, but the rewards for the future are priceless. This week I felt an emerging of a part of me that has always been there, I know her well, but she was buried beneath all the protective layers that kept her safe from harm. Now as she emerges I feel an awakening happening that is like nothing else. I am truly being myself and it feels like life now makes so much sense. I believe in myself in a way I may have only felt as a very small child. I believe I am an artist, a dancer, a leader, a writer, a poet, a thinker, a spiritual being, a creative spirit, a beautiful person and I feel the love that I am being demonstrated to those who encounter me on this journey. Being in Rwanda has opened me up to my own inner truth in a way I hadn’t even imagined could exist but now that I feel it it seems so obvious that this is what life is meant to feel like. The last two posts were really big steps for me and it is since then that I have really felt the letting go happen. I have been keeping those events secret and locked inside me for over 20 years, imagine what that does to a person’s body, soul and mind. There are other things that now can be released because I removed some of the biggest obstacles to them feeling safe to go. Swami Radha said that when we do the work on the big issues the smaller ones can sometimes seem less important and fall away. That is what I feel I have stepped into now. There is more to uncover with big issues and as I go deeper into them I trust that more of myself will be revealed and by that time I will have so much confidence that nothing will be able to move me from this place of knowing I am living my life, my way. 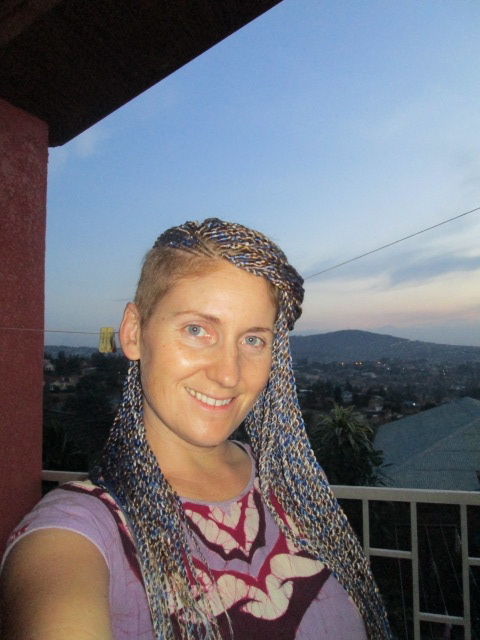 I took a step further into my confidence and had my hair put into “rasta twists” yesterday with blue, white and blonde hair extensions. This was a 7 hour process from start to finish and is something I have done before. When I was 25, I had cut off nearly 2 feet of hair, which I had been growing out for 3 years in preparation for the event, to donate to “Locks of Love”. I had raised $1200 to contribute to the donation as well which was also a way to push myself into doing the actual act of cutting. I was very attached to my hair. When I did do it I quickly realized I was not ready and it was a very challenging time for me in terms of self-esteem issues. I felt a total loss of identity and was convinced I was to masculine to have short hair. So I let it grow and when it was long enough I went to Ebony and Ivory Salon in Edmonton and had a weave put in which also took 8 hours and cost $300. I walked home nervously with my new head of hair which felt like a giant ball of tightly wound plastic on my head. It took a few hours of crying and freaking out for me to decide but I eventually started cutting it all out. I didn’t let anyone see me, not even my boyfriend at the time. I felt like such a loser, so phoney and so ugly but really I just lacked the confidence to own this new look of mine because it was actually pretty awesome! 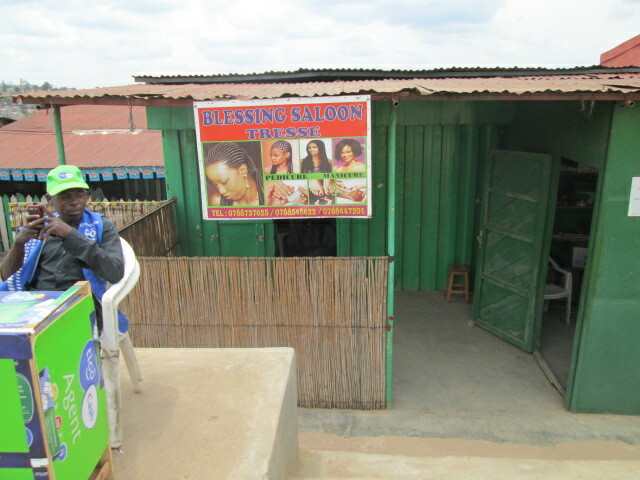 So as I sat in the tiny metal shack with other Africa woman being a part of a rich cultural experience I was pleasantly surprised to see that this time all I heard in my mind was “This IS who I am!” I am a woman who has blue hair extensions. 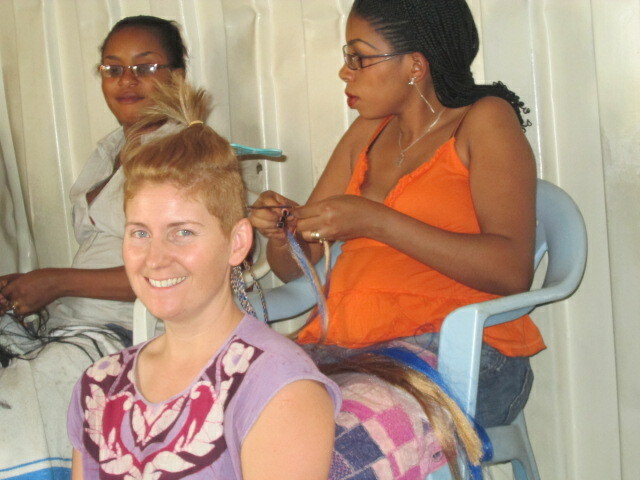 I am a woman who likes to fully embrace other cultures and is not afraid to try new things. I kept on hearing myself say, “Yes! This is what I want!” I made it happen for myself in the way I wanted it and it is an outward expression of who I am on the inside. 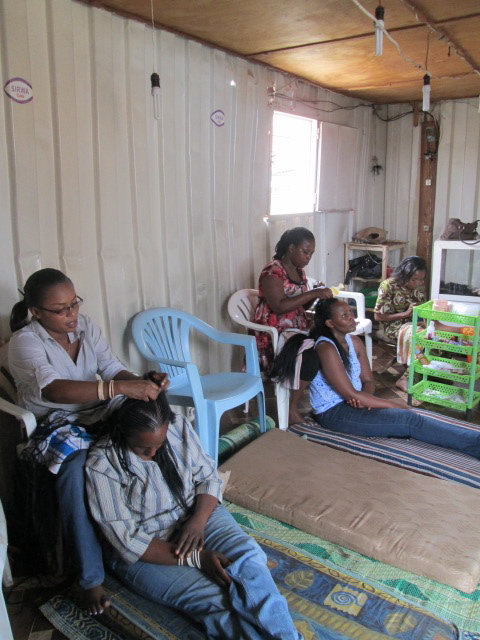 It also gave me a very female experience of bonding with other woman. We sat there in this small space together for hours, talking, touching, and making each other feel beautiful. I have not have or allowed many experiences like this in my life and today I saw how powerful they really are. We are woman, we are here to support each other and build each other up, make each other feel beautiful, wonderful and special. Learning to allow this into my life started to emerge when I had my nervous breakdown and began to rely on my best friend who at that time was not really that close in my life. It has been through this process of me letting go and letting good things in that we have become extremely close and she was the first person I thought of when I walked home with my new look. I heard her saying “You look amazing, I am so proud of you!” and sure enough that was pretty much exactly what she said. 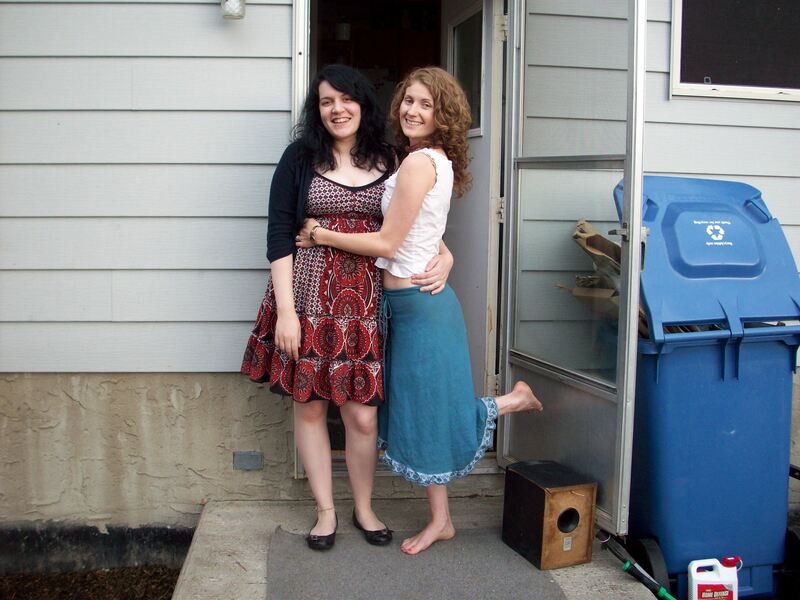 She has lifted me to new levels of confidence and repeatedly told me all the good things about myself that she loves. It is because of her positive influence that her voice is beginning to replace the voices of those who told me I am anything other than AWESOME! I love you Care Bear, Thank you so much for being you and for being in my life through thick and thin. 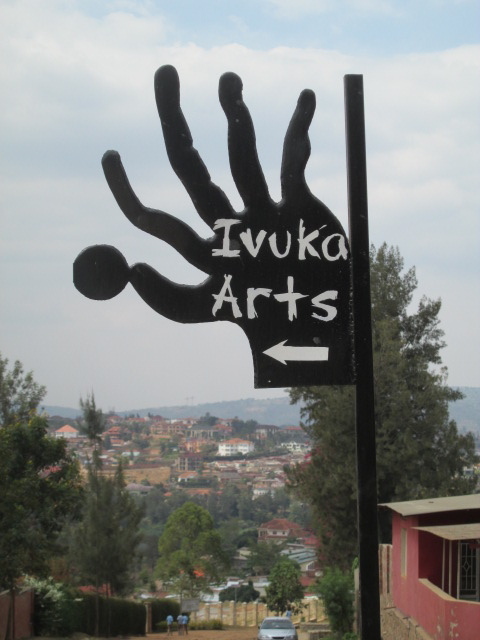 As I prepare to move into my new home, which turns out to be an art Studio called “Ivuka Arts” which is in right behind “Inema Art Centre”, I realize that everything is guiding me towards fully embracing myself as an artist. I had found a fancy, schmancy place to rent that was a beautiful space and I wanted to be there but when I called back and it was taken it was a sign that something else was coming to me. 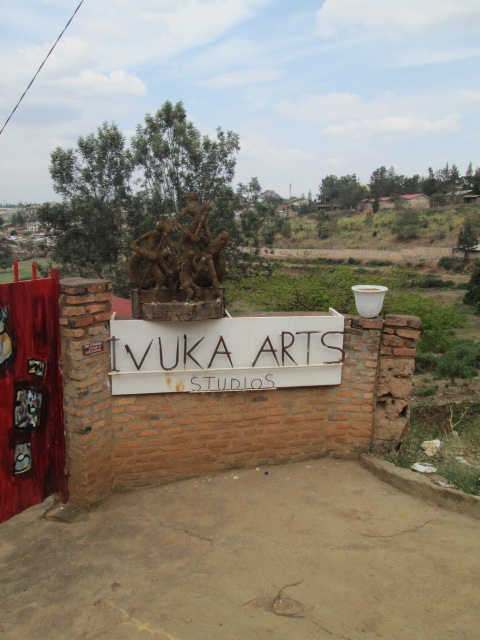 Then I received a very vague email from someone saying they had a room and after a few questions I realized it was the art center that I had initially been thinking of when I though about doing art work here in Rwanda. Turns out that I will be in Emmanuel’s room, he is the founder of Inema Art Center where Thrill The World will be held and I felt a familiar feeling of knowing him when we first met which inspired me to do the first two paintings there at his studio. Oh the connections! Sometimes this game of life feels so easy, and so obvious and other times like a dark room, full of mud. Tonight as I opened the door at the home I currently live in to the woman who is moving into my room, she looked at me and said “I know you, Jambo Beach!” It was a girl that I had danced with briefly the night my camera was stolen in Gahini, which is 2 hours from here. Then she said “wait there’s more, the DJ from Jambo is here too!” and then a man came down the stairs and said “Oh yeah, lost camera…” Too funny! I had also run into another one the girls from that night at a concert called “Kigali Up!” last month. I was dancing alone and a woman came up to me and said “I know you. Jambo beach, right? I knew I knew you from the way you dance!” Both of these moments boosted me in ways that I can’t put into words. To be recognized by my dancing style is a strong message for me, especially in a foreign country and with so many amazing dancers here. To be recognized even when I now have long, blue hair tells me that people actually do see me. They see me when I am plainly dressed, when my hair is not how I want it to look and Im least expecting people to notice me. It just made me realize further that I have a bright spirit that people remember and it has nothing to do with my outward appearance, this is a huge gift to finally be embodying this knowledge. Now I can bring back the outward expressions in a way that are not a desperate attempt to be seen for who I really am. I know who I am and that is all that matters. What I learned was that I know what I want – ie: I wanted a nice room with a jaccuzzi jub and private balcony, and I know I can give those things to myself but when they are not available or are taken away from me I also know that what I need is being offered to me in a new way. What I need right now is to step deeper into my healing journey of self expression through art work. I have an idea for a project to help me continue to heal my heart. 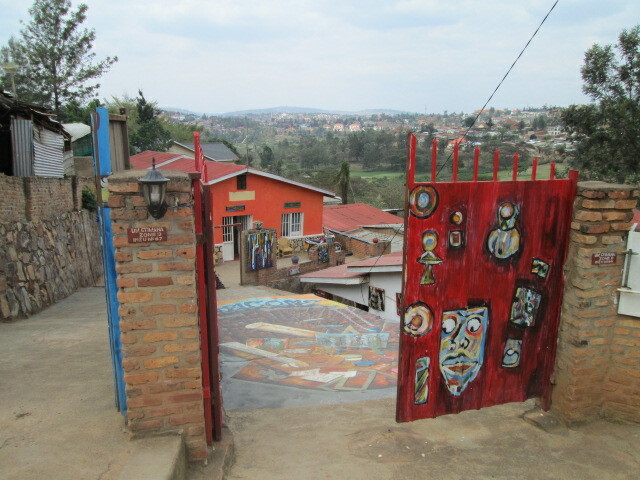 Living at an Art Center in Rwanda surrounded by art, artists, and creative energy doing an art project that I inspired, I created, I manifested is exactly what I need to do to FULLY embrace myself as an Artist. No one can tell me that this is not real and that this not what I am mean to be doing right now. Life is so full and rich in this moment yet I know there is soooooo much more to come. Is my vessel clear enough to allow in more light? Another reason to continue to process and let go of old baggage is to make room for the new, bright and brilliant things that are just waiting for me to have the space. What’s next: New clothes – finally!